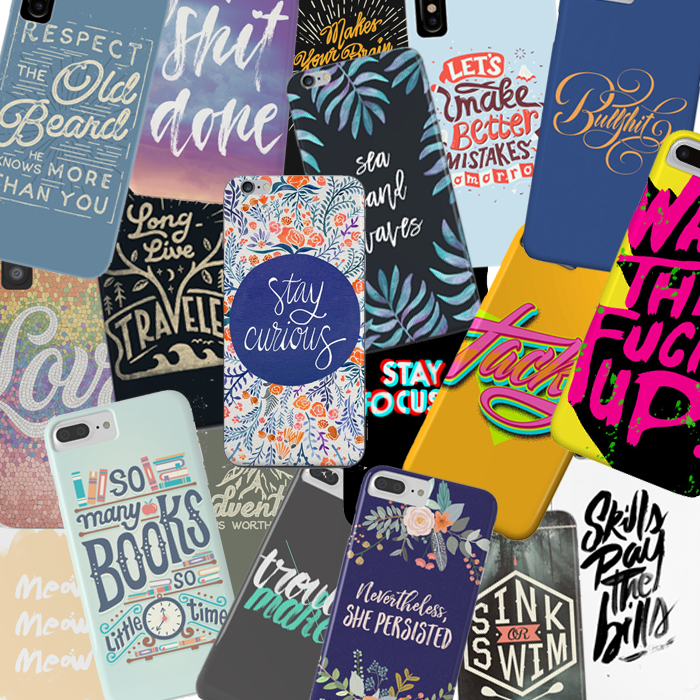 Designer Phone Cases - Designs by Typography Artists | Typeyeah. Designer phone cases are a thing! Depending on your location, you’ll most likely find a better range online. I recently upgraded my phone to an iPhone8 which so far I’m really happy with. Knowing my luck, if I don’t get a case for it soon, i’ll end up dropping it and cracking the screen like so many of my friends have done. I had a look around the local shops but all of the cases seem to be pretty plain, either just flat colours or have some type of generic pattern. As you can imagine, typography is a must in my day to day life so I am in search of a new phone case to fulfil my deep lettering needs whilst supporting artists around the world. I have searched around on some of the major players in print on demand marketplaces. Enjoy! Most if not all of the above designs from independent artists are available as smartphone cases and smartphone skins for a variety of smartphones including the new iPhone X, iPhone 8, iPhone 8 Plus, iPhone 7, iPhone 7 Plus, iPhone 6, iPhone 6 Plus, Galaxy S8, Galaxy S7, Galaxy S6, Galaxy S5, Galaxy S4. Best to check the individual designs you like for exact availability. Which are your favourite designer phone cases? Let us know in the comments, and I will keep you all updated on the design I decide to go with!